Consisting of seven clans, the Meithei people, also spelled Meetei or Meithei, are the majority people group of Manipur, India resulting being referred to as Manipuris. Their language, Manipuri, is the predominant language and lingua franca in the southeastern Himalayan state of Manipur, in northeastern India. It is the official language in government offices. Moreover, it is also spoken in the Indian states of Assam and Tripura, and in Bangladesh and Myanmar. Traditionally in their homeland, they resided on the plains making them distinctly different from people groups residing in the hills. They language also serves as a distinguishing identity along with their religious adherence. Although the Meithei claim Hinduism as their religion, they most often guard and retain their distinct culture of ancestor worship, animism and shamanic spirituality. Pray when Christians encounter people from the country of India, they will ask the right questions to discover where they are from in India and also their distinct people group identity. Pray God will work in the minds and hearts of Meithei to understand the Gospel message. 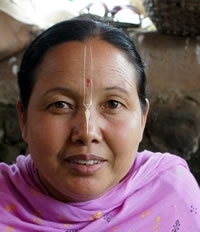 Pray God will call out Christians to minister to the physical, emotional, and spiritual needs of the Meithei people.